The gripping follow-up to A Shot at Peace. The Trial is over and Colfar waits in prison for the day of his death to arrive. A desperate rescue pries him loose, while many of his friends remain behind. But, who are his rescuers and can he trust them? Faced with the heartbreak of betrayal, Colfar’s shattered emotions are dragged through the wilderness as they flee the city. Hoping desperately the rumors of a Defector community are true, they search for possible allies in the Millers’ struggle for freedom from the oppression and violence of the Nadeens. But who are these strange new figures with ties to Hannah? Why does fate continue to entangle Hannah and Colfar together? 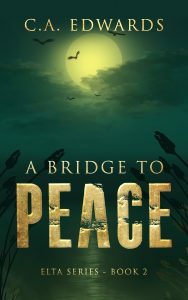 Together, can they find A Bridge to Peace?